Top: West Kennet Long Barrow, part of the the Avebury World Heritage Site in Great Britain, with Silbury Hill in the distance. 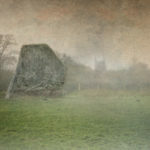 While most of the meaning of the Avebury complex is lost to time, we know that the ancient’s beliefs about death and the dead were based on a more intuitive understanding of life. 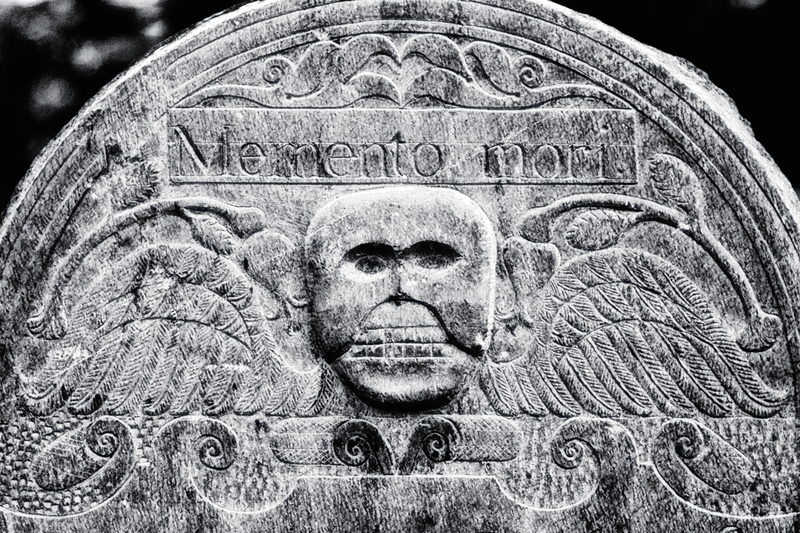 WE MEET DEATH IN MANY WAYS, in many guises. Sometimes it strikes quickly, openly, savage in its intensity. Mostly it takes its time, a small temptation that seems innocent – a love of sweets, a cool draught of liquor on the tongue, the rush of nicotine from a cigarette, simple pleasures that become addictions and break down the body over time. Too often Death leaves to us the dirty work of killing ourselves. We’re connected now to the world, and it seems death is everywhere. We awoke last Monday to 59 senseless deaths in Las Vegas, strangers to most of us but we saw in those deaths our own. The sadness was real for we’re an empathetic people, to a point at least. But with those deaths came fear – it could have been any of us. Death seems to be everywhere, falling on us in places we thought safe. And so we learn to fear crowds, strangers, people who are different from us. And yet death is more rare than it ever has been. You’re more likely to die in your bathroom than from the hands of terrorists. And yet we change our lives, our country and our culture to protect ourselves against madmen. Then go on living lives that brings us closer to death without thinking. Just that nagging feeling that we should be taking better care of ourselves. In the past, death was closer and didn’t have the filters we have now. We push the mechanics of death further away, turning a blind eye to the details that our forebears dealt with as a matter of course. We seldom die at home now. If our loved ones die there we say goodbye quickly and slip out the door before the undertaker takes them away. We don’t see them again till they’re tidied up, spending their last few days in funeral homes rather than their homes, our homes. In the past the corpse stayed right there with the living. 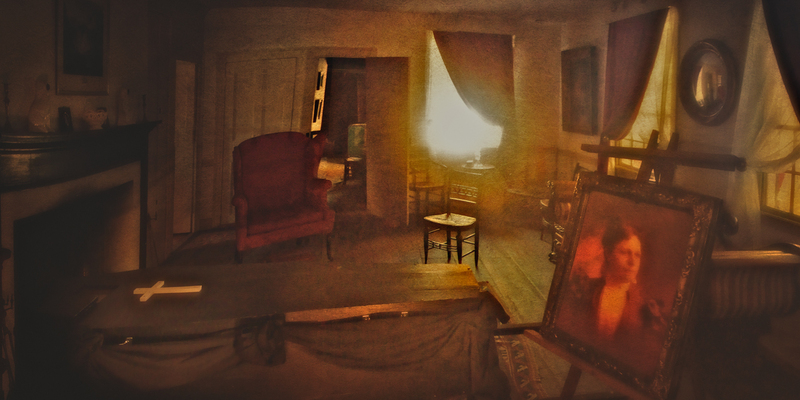 There was no escaping it, the smell of death permeated the air, the body in a box in the parlor, a stream of visitors knocking at the door, sitting with us through the night as we kept vigil till the time we had to say goodbye. The graves were closer – we didn’t have to take a drive to visit the dead. We passed their graves every day as we went about life, as they lie rotting beneath the surface. We were thrown into the experience, there was no escaping it. I can’t help but believe that rather than making things worse, death lost part of its sting. It wasn’t so mysterious, so separate from life. It was a part of life. I’ve seen five deaths up close. The first was when I was quite small, on a sun baked interstate highway cutting through Georgia. There were no speed limits back then, no air conditioning in the cars and people flew down those highways. Nearly every time we went south we passed through self destruction brought on by speed and iron. On this occasion, as we wound through the scene, the traffic crawling along, my parents told us to get down in the seat and hide our faces. I can still see the man. He was black, wearing a straw fedora, his eyes open wide, blood pouring from his mouth, still sitting in the driver’s seat, his head back at an unnatural angle on his broken neck. Another body lay in the grass, covered in a white sheet with the blood soaking through. My mother caught me looking and made me take a drink of water. I didn’t know why, still don’t. But to this day when I’m in a funeral home, when I’m around the dead, I thirst. None of those five deaths were movie deaths. In films it’s always so peaceful it seems, even deaths from violence. There’s a pained expression, a sad look into loved ones eyes, a deep breath and then peace, a look of tranquility spreading over their face. They are gone. I’ve not been fortunate to see one of those. The faces are drawn, the last breaths are horrible gasps, the expressions tortured and unaware of a need for dignity. The life leaves the body and the body remains as it was when vitality left. So much senseless death, our empathy is sorely tested because it’s so often used. We know of deaths today that a hundred years ago would have taken us years to find out about, if we ever found out at all. We’re affected by the death of a stranger around the world, of a person we never knew, who never did anything of note, except die in an usual, compromising or horrifying situation. We’re death voyeurs. And then someone close to us dies and we realize how powerful the experience is. For a death to be truly felt, it has to be truly local. It has to be someone who lived in your heart, and in whose heart a love for you could be found as well. My dad died last week and I was there for the end. Or rather the final pronouncement of death, for it was obvious the moment I saw him, that even if there was a pulse, he was gone. 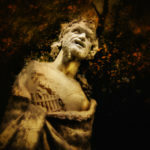 I saw it in his face – not a tortured mask, just inanimate flesh and bones without life to give it its natural expression. On his features was an expression that exist nowhere but in death. I knew he was gone before I set foot in the room, for I believe he passed by me at the moment it happened. But that’s a different story, for a different time. Since that night I’ve felt nothing supernatural, though two of the people who stayed with me this weekend had their own experiences. I live in the house where he spent most of his life, where many people who are now gone had formative experiences. This house knew life, but now I’m here alone and I don’t mind saying, I’m a bit on edge. A month or so ago the sun was eclipsed by moon, another ancient ritual. Tourists inundated the roads, flocking to places few ever visit except those that live around here. Parties, celebrations, drunken revelry. An hour away, Ozzy Osbourne was barking at the moon in a bean field under the hot August sun. I chose to watch from a country graveyard near the river, Dogtown Cemetery. It sits on a hill overlooking what a couple thousand years ago was a village. 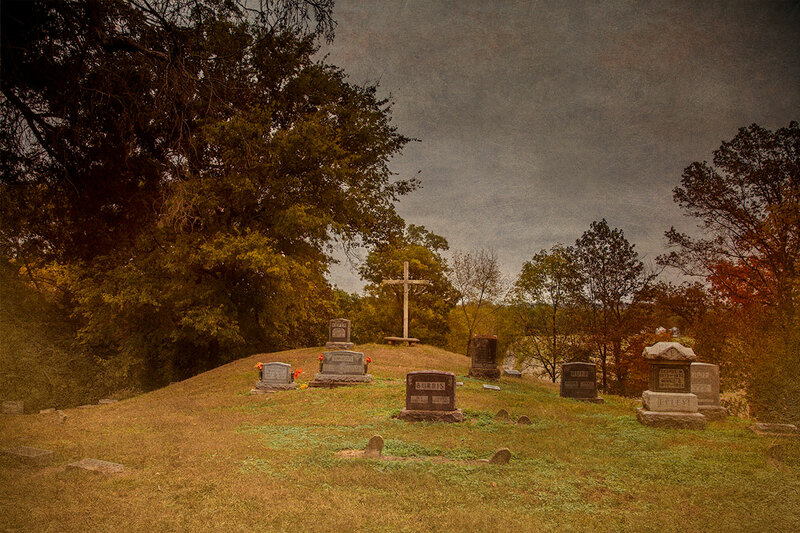 On the hill overlooking it, the Hopewell people built a mortuary, a necropolis. A city of the dead. Corpses lay upon platforms under the sun, the skin melting away to expose the bones, that which remains of us when the soft parts are no more. The ancients venerated the bones. The words “he is gone” were never uttered, because these bones remained their ancestors. We look at life as leaving the body at death, the corpse nothing more than a carcass. We treat it with reverence, but we keep the person separated from the horror of what becomes of the body. Today we see a skull as ghastly. To the ancients, it was their father, mother, child. In life and in death. Death did not take with it the power of the corpse. The native American graveyard I watched the eclipse from was coopted later by white settlers. I knew the graveyard up until last year as the final resting place of the early white folks of the area. I vaguely remembered something about Indian mounds, but nobody seemed to know any of the details. Though there are several Hopewell sites in the area where I live, most of what I know about the Hopewells came from studying neolithic sites in Britain. 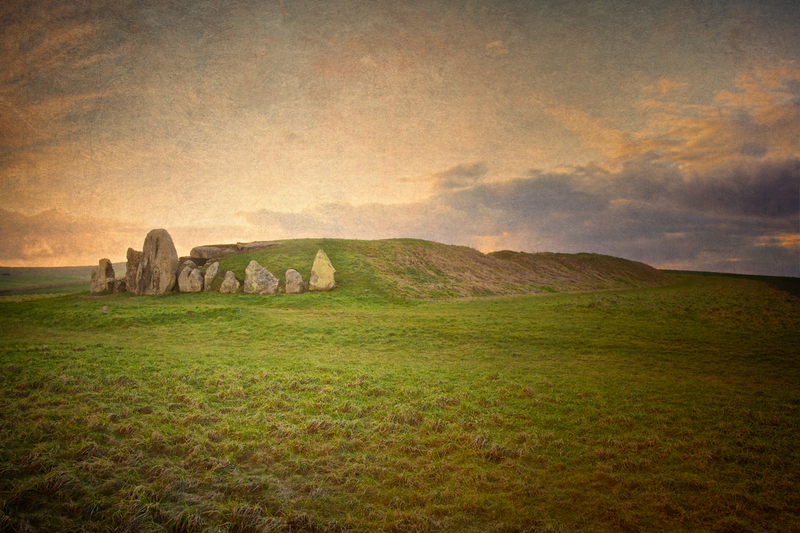 The Sanctuary at Avebury was believed to be a mortuary site, similar in purpose to many Hopewell sites in the U.S. The Sanctuary in the Avebury complex in Wiltshire, at the terminus of the West Kennet Avenue of stones bore a similar purpose to the Hopewell necropolises. Quite often I’d see illustrations of the Hopewell versions, to show what happened in sites like the Sanctuary. I’d been to Avebury a few times, thousands of miles away before I learned that we had the same thing a twenty minute drive from here. The Sanctuary isn’t the only mortuary in the Avebury complex. West Kennet Long Barrow, a short walk away, situated on a high chalk ridge overlooking Silvery Hill is one of the finest examples of its kind in Britain. They started building it about 3650 B.C., and once built it remained in use for a thousand years. Yet only 46 people were found interred there, all having died in a period of about 20-30 years. Many have theorized that the times of these ancient monuments culminated with Stonehenge a short time afterwards, and was a sort of golden age. But this is belied by studying the bones found within West Kennet. All suffered from arthritis, various maladies, overall ill heath, there were children as well as adults, and traumatic injury wasn’t rare. This was a hard life. The barrow itself is an engineering marvel for the time. It would have taken over 15,000 hours to build. About 100 meters long, with five stone chambers inside connected by a central aisle, it’s incredible that so much effort was put into something that held so few people. The core of the barrow is built of sarsen stone, with chalk rubble filling the gaps. Though covered with soil now, when in use the chalk which covered it, sitting high on the ridge would have been visible for great distances. The equally enigmatic Silbury Hill which was built below the ridge would have shone white as well. West Kennet Long Barrow stretches back 100 meters, the longest and one of the best preserved of Britain’s neolithic burial sites. Avebury, Wiltshire. Rituals and ceremonies were held here. The dead had a place among the living. Skulls and long bones are missing from the skeletons found within, and it’s thought that this means the bones were taken elsewhere for other rituals. The living didn’t just come to the dead. The dead went out among the living. The implications are hard to miss. The dead were a part of life, not tucked away and hidden. Four thousand years of religion and custom had yet to change them from a more intuitive belief system. They didn’t shy away from death. They saw what lie beneath the skin, what we all become and not only accepted it, but honored it. The dead were still among them. 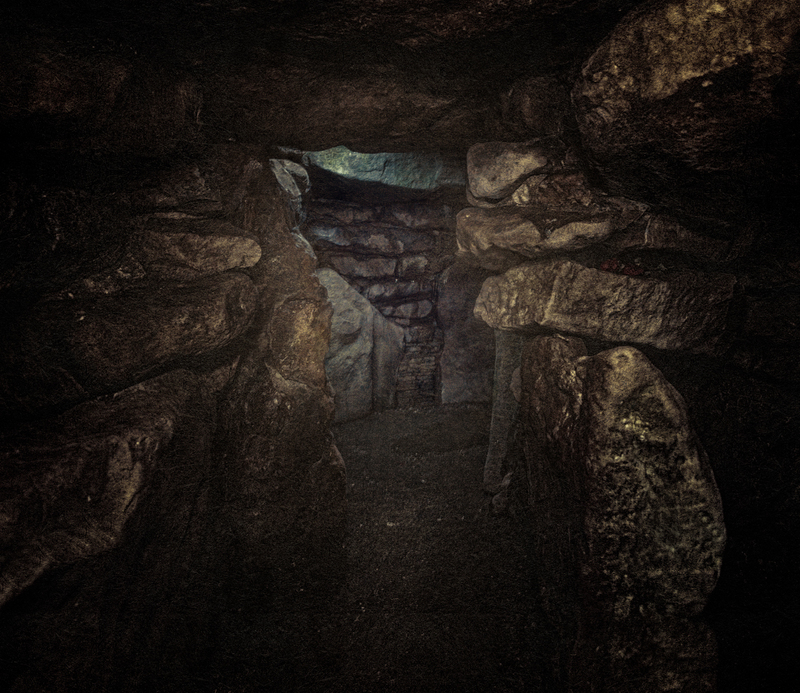 The interior of the West Kennet Long Barrow in Avebury, Wiltshire. The complex appears to have been originally been built to hold but 46 skeletons, all dead within about 40 years, though the site was in regular use for a thousand more. At the same time they were building the West Kennet Long Barrow, an enclosure was going up atop Windmill Hill, Less for defense and perhaps more a fortified trading post, it’s obvious that Windmill Hill had a singular role in seasonal celebrations in the Avebury complex. Evidence exists there as well for a mortuary complex, the bones of their dead perhaps ringing the outer walls of their enclosure. Great feasts were held inside these rings, not isolated from the past, but at the center of it. People seem to have brought their most holy items here to leave behind, gifts for their ancestors perhaps? Many of these bore the marks of fertility gods and goddesses, and it’s thought that the celebrations included not only tributes to the dead, but sexual rites – devoted to the creation of life as well. 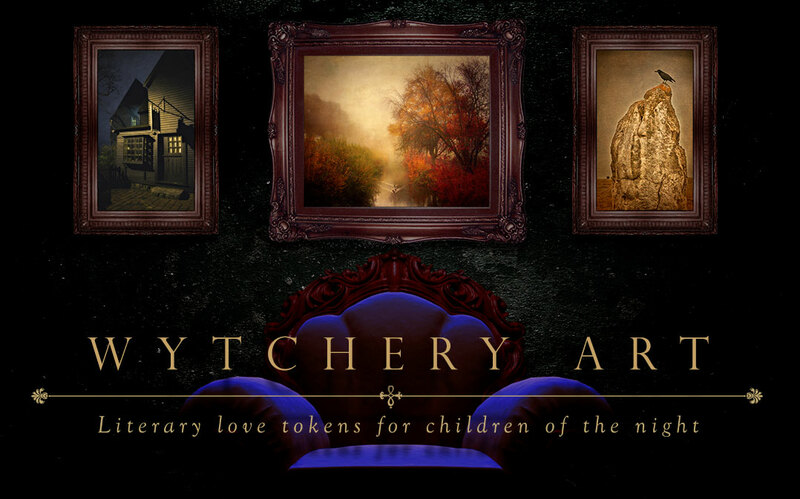 Sexual rites held in public, surrounded by a crowd, energized by feasting and libation, themselves surrounded by a circle of the dead – it’s a scenario out of a horror film to us today. But to these people it had meaning. It was important enough, essential enough that they spent thousand upon thousands of hours building these monuments, for purposes we can no longer understand. We lack the intuition. Windmill Hill was being used for trading, celebrations and veneration of the dead concurrently with the construction of West Kennet Long Barrow, among the earliest of the Avebury sites. Avebury is most well known for its massive henge and stone circles within, the largest in Britain. Within the main circle are two stones situated together. 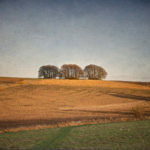 A third once stood nearby and this grouping, known as the cove was the earliest feature of the Avebury circle and henge. 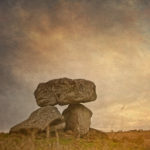 The grouping resembles a dolmen, a type of chambered tomb, such as Devil’s Den which lies a short distance away. Coves are common features in the stone circles of Britain, and where they’re found, there is often evidence of funereal use. 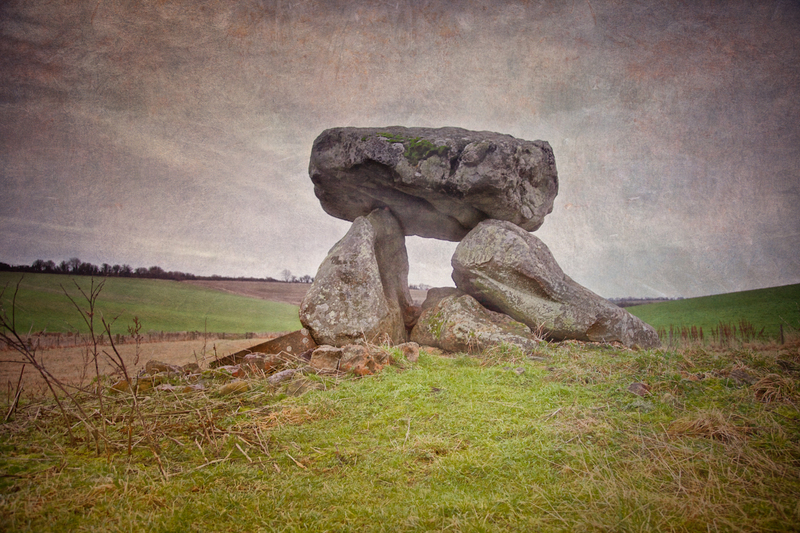 Devil’s Den, near Avebury was an example of a dolmen, an ancient burial chamber. Originally it would have been covered with turf. The cove at Avebury is no exception. It’s also long been known that the stones of Avebury can be separated into male and female, and the stones of the cove bear witness to this. 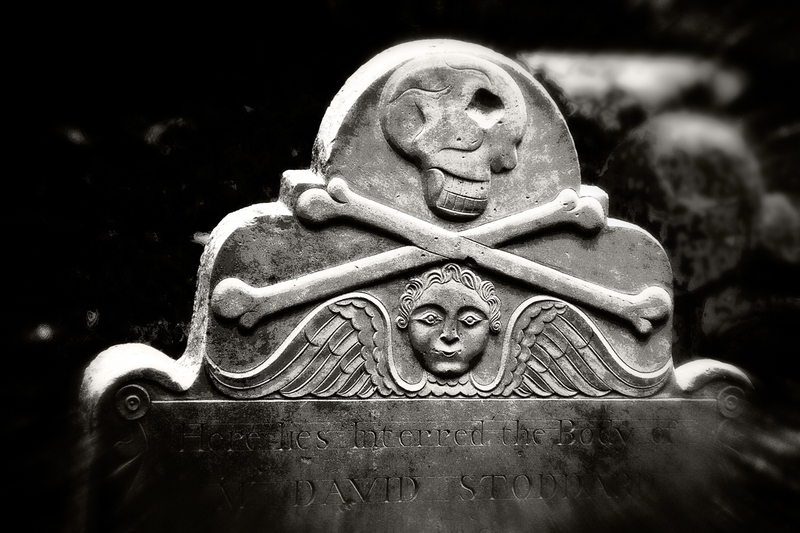 So here, as well as at Windmill Hill, there is the connection between sexuality and death. How important was it? It’s entirely possible that the female stone of the cove was in place before the others were added. Which would make this stone the nucleus around which the largest of neolithic Britain’s stone circles was built. 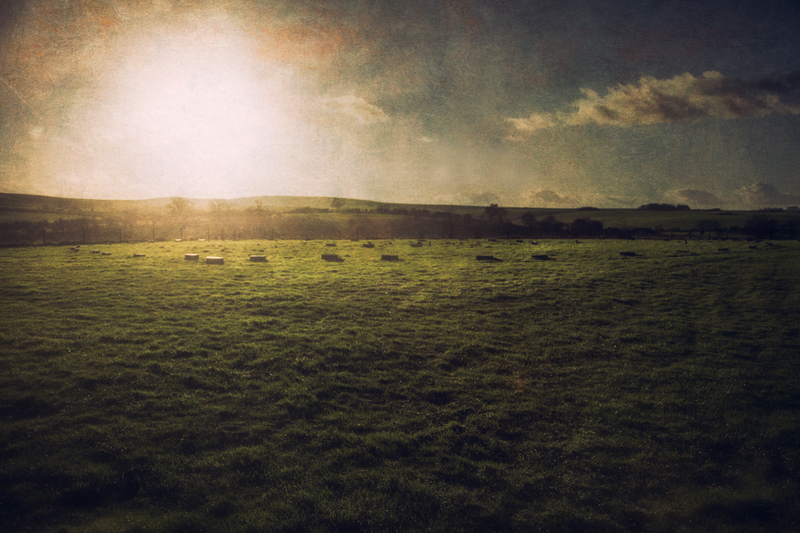 The cove at Avebury. 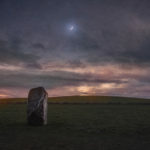 The feminine stone on the left is thought to have been placed in its current position by nature, and the entire henge and stone circle built around it. In places such as the cove, ancestor worship and sexuality went hand in hand. With twenty-first century eyes, this fascination with the dead seems morbid and ghoulish. But as I said, we have four thousand years of religion and custom which takes us away from an intuitive understanding of how death, and life works. 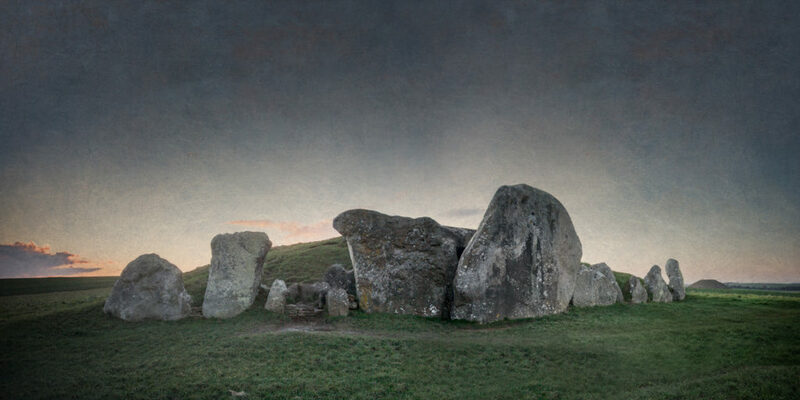 For a thousand years or more, people gathered at West Kennet Long Barrow. Rituals were held in the courtyard and inside the tombs. The bones were removed for feasts and ceremonies elsewhere. And then their relationship with their dead seems to have changed. The barrow was filled with small bits of rubble, to the top of the ceiling. And yet this wasn’t just any kind of rubble, but the type normally associated with offerings to the dead. Even at the end of its life, the tomb demanded, and received reverence. They then moved giant sarsen stones across the entrance. 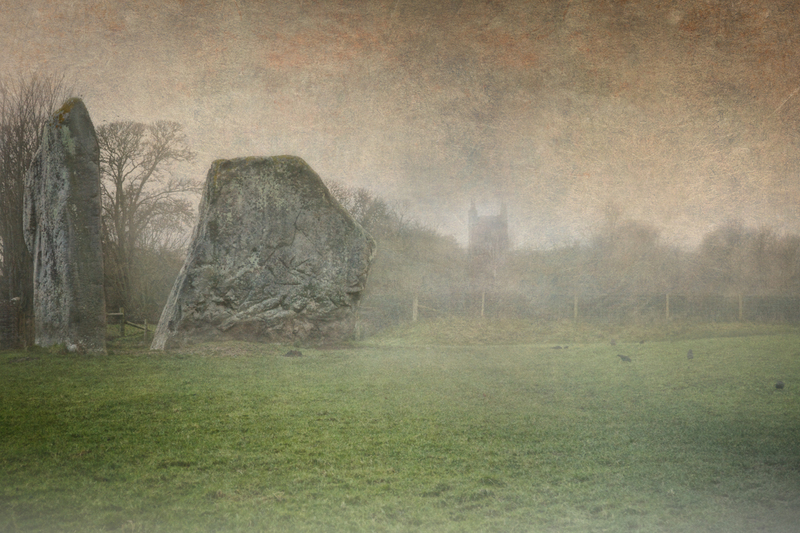 There were still ceremonies held there, and it still had a place in the world of the Avebury complex. But from this point on, it seems the Neolithic attitude towards the dead shifted, to where the dead remained buried and out of reach. We’ll never know why, there were no written records and archaeology is poor at telling us why people did what they did. Death can sometimes be messy and gory, a true horror story. All life starts the same way, yet we learn to see the beauty of birth, despite the slime. Our ancestors watched their loved ones decompose under the sun, in the rain, the snow, the ice. In the same way we find the beauty in birth, they must have learned to see the beauty in death. We’re a rational people now. We look to science for answers and ignore our intuition, if indeed we can even feel it. We insulate ourselves from the bodies of the dead, and assign our ancestors a place in memory only. We have photos of our dead now, as they were in life, to remind us of who they were, not what they became when what we deem to be life ends. These reflections of a life take the place that the bones held for the ancients. The rational mind now tells us what the ancients did not believe, that these bones are not our loved ones. That they have fully departed. And yet that thought is so new to us as a culture, as to be an infant in the cosmology of our beliefs. There’s a power in the bones. That makes them sacred, it imbues them with our imagination. And in the case of a culture like ours, with a sickness of the mind and a fear of nothing holy, it keeps them somewhat safe from desecration. Because our love of the rational has dispensed of the supernatural. Our fears are concrete. We don’t fear the dead, because the body is just a shell. Instead we fear death. While I’m sure they didn’t welcome it, I’m also sure the ancients didn’t fear it as we do. Maybe they had to see it as a part of life, because it’s one of two experiences we all face. And it’s something they faced more often, with more mystery surrounding it than we have. We shrink from it. When we come face to face with it, we pay people to take it away and clean it up before we have to see it again. We bury it for all time, six feet under ground, under a concrete vault. Like the ancients, we still erect stones. But while we use them to mark the end of the journey, the ancients used them to create great doorways, so we, and the dead, could go back and forth between the two worlds. Maybe that’s progress? Maybe we trade our past for the future. But perhaps our distant ancestors saw things our disbelieving eyes refuse to accept. Perhaps we are in the end, less wise for being less primitive.